Research is reflected in the innovative and sinuous design. an ergonomic shape for your hands. 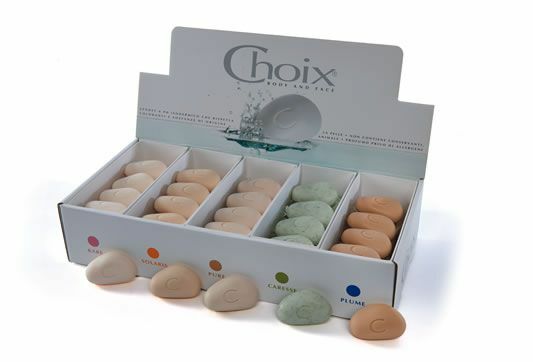 Choix is a soap but it does not contain soap. It is a cleanser with physiological pH similar to that of the skin. In a few words: extremely delicate. of durability, refined essences, design. The first thing you notice when you open a pack of Choix soaps? A special fragrance, gentle, non-aggressive. Imagine it on your skin. of the modern schools of design, but it is not an ornament. Kare is a soap full of moisturizing substances that inebriate your senses with aromas that remind of distant countries. Choix Syndet Cube is a return to origins, a tribute to the purity, a soap that offers a wellness experience. Quality is everything for Kare, Caresse, Solaris, Pure, Plume: 5 different soaps produced by a company that has as its mission the most advanced cosmetic research. Our knowledge and our research is at your service. It is time to dedicate some attention to your skin and your needs, because there is nothing more precious than health and well-being. Try our products, you will not get along without. A soap that cleanses, a soap that takes care of your skin with a gentle exfoliation thanks to the filaments of loofah plant. What do you search for a face and body soap? A simple detergent or a packaged product with high quality ingredients that respects the skin? Do you content yourself with a simple soap, aggressive and anonymous, or do you want to leave a pleasant fragrance on your skin? Even the choice of a hand soap is important, especially if you are not satisfied with an ordinary product. Choix Syndet Cube meets all your needs: smells long, contains natural essences principles and does not mistreat your skin. In addition, due to its ergonomic shape, it becomes an object of design. One more reason to choose Choix syndet Cube: it is a soap that does not contain soap, but a solid synthesis detergent at physiological pH similar to that of the skin unlike traditional soaps at alkaline pH that attack and damage the hydrolipid layer. A quality soap cleanses, leaves a good fragrance for a long time and respects the skin. For that reason Choix fragrances do not contain preservatives, coloring agents and animal origin substances. In addition the fragrances we use, are allergens free. We take care of you. Are you on holiday? Take care of your tan with Solaris, the soap with beta-carotene for skin exposed to sun or UVA and UVB rays tanning lamps. Where Can You Find Choix Soaps? Little by little we’re coming across all over Italy. The desire to give your body a special treatment, a treatment that respects the skin and smells for a long time, increases. Choix Syndet Cube retailers have also increased. On this page you can find the list divided by city: choose the closest dealer to you and give your body a new experience. The beauty of the skin also feed through health. This is this the reason for Pure born, the soap for oily and seborrheic skins of Choix which helps to fight acne. The main aggressive agent against your skin? The soap. For this we studied Plume, a detergent for sensitive and well-cared-for skins as those of children. Even the choice of a hand soap is important, especially if you are not satisfied with an ordinary product.